The dangers posed by nuclear weapons are utterly unacceptable, and the only sure way to prevent an unthinkable catastrophe is to eliminate them completely. There are still more than 15,000 nuclear weapons in the world today. The indisputable evidence on the medical, environmental, and humanitarian consequences of nuclear weapons and nuclear war was presented at three international state conferences in Oslo, Nayarit, and Vienna, and was taken up again at the recently concluded UN Open-Ended Working Group taking forward multilateral negotiations on nuclear disarmament (OEWG). 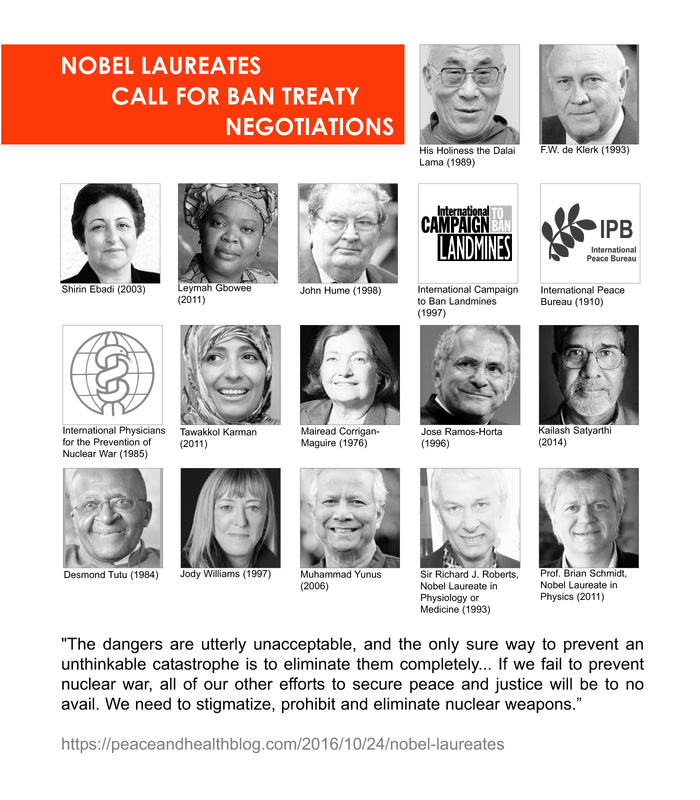 As Nobel Laureates, we urge the First Committee and the General Assembly to vote in favor of this resolution and to ensure that negotiations on a treaty to prohibit nuclear weapons commence in 2017. These should be brought to a timely and successful conclusion so that we can proceed rapidly toward the final elimination of this existential threat to humanity. Thanks for your comment, Cary. There are no fixed dates. The full General Assembly vote on L.41 should happen later this month, though sometimes voting slides into early December. We expect the resolution to clear this last hurdle by the same majority…perhaps with even a few more yes votes. The negotiating conference will then take place in March and June. One thing we can all do is talk about the negotiations and the ban treaty in our own communities, so that people better understand what they’re about and why prohibiting and eliminating nuclear weapons is so important. Persuading the nuclear-armed states to finally eliminate these abhorrent weapons will be the last thing that happens, but we need to remain confident that it IS the right thing and that it WILL happen. That’s not to say it will be easy. It won’t. What can the individual do to promote the abolition of nuclear warheads, or END all future nuclear testing. If the UN Security Council does not listen Nobel Peace Prize Laureates, how will they listen to me? ?